Water is the essence of life. The average adult is composed of almost 60% water. Drinking water helps nearly every part of the body to function at its best, but not all waters are created equal. Chlorine-free water and bottled water may be "clean" but they are so stripped and adulterated, they can do little or nothing to enhance your health! The Hexagon™ 8 Stage Water Purifier gives you more than just clean water. It produces Π Water or Energy Water that is endowed with many wondrous properties that are important for supporting life functions. 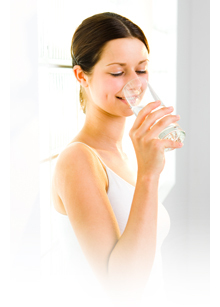 The Hexagon™ 8 Stage Water Purifier infuses water with ionic minerals and trace elements like iron, magnesium, zinc, calcium, sodium, potassium, manganese, etc. that are vital for health. Every sip is delicious, sweet, refined and smooth. The Hexagon™ 8 Stage Water Purifier increases the water´s pH to a mild alkaline level to perfectly match the body´s pH balance of 7.2 — 7.5. This helps to combat unhealthy acidity in the body. It enhances detoxification and elimination of waste, and helps in attaining and maintaining overall good health.